Posted on August 3, 2011, in Uncategorized. Bookmark the permalink. 4 Comments. Exactly WHAT is this thing??? 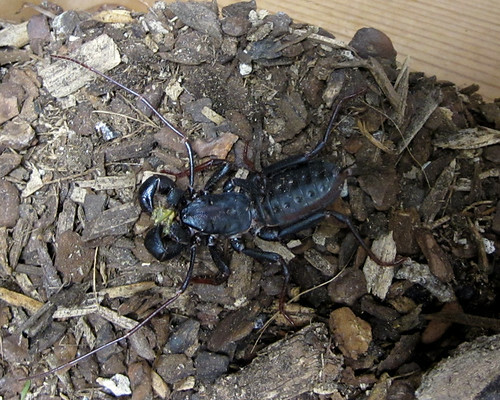 It is a vinegaroon, also known as a whip scorpion! They are arachnids, related to spiders and scorpions. They do not have a stinger, but are able to spray mild acetic acid. It’s harmless except if it gets sprayed right in your eyes. They generally stay in an underground burrow, emerging at night to hunt. They live in the southwest and are most active during the monsoon season. If you find THEM adorable, there’s still hope for ME!